In 2017 CoreTeka started actively supporting the development and promotion of IT-community in automotive, retail and logistics fields. To this end, CoreTeka initiated a special framework within the company, devoted to the achievement of the above-mentioned goals – CoreTeka Events. 2017 was a year full of interesting and helpful events: two Automotive Startup Crash Tests, CoreTeka Automotive Hackathon, Automotive Zone at iForum, Innotech, participation in Ukrainian Logistics Community (ULC) activities, etc. Startup Crash Test is an event aiming to bring IT-entrepreneurs, working on automobile projects, together on one platform. Participants could present their startup ideas and receive valuable feedbacks from successful market practitioners and target audience. 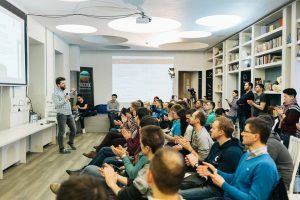 CoreTeka Automotive Hackathon is a unique event, the first Ukrainian hackathon of automotive innovations and transport technologies. The event was attended by over 70 developers from across the country and abroad. Under the guidance of experienced mentors, within 48 hours teams transformed their ideas into high-quality projects‘ concepts, aiming to solve existing problems in the automotive field. Two hundred people, interested in technologies for the automotive industry, visited the event within 3 days. CoreTeka Automotive Zone at iForum. 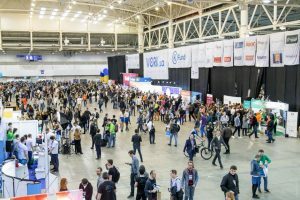 At iForum CoreTeka, as a company which is constantly developing and supporting Ukrainian IT-Automotive community became a co-organizer of Automotive Zone at the City of the Future, where IT-Automotive projects were presented. Ukrainian Logistics Community events. CoreTeka is an active member of ULC (Ukrainian Logistics Community). Alex Isachenko, CEO of CoreTeka, has visited Ukrainian Logistic Community with the presentation concerning technologies and trends that will be widespread in logistic and transportation spheres in several years. The year 2018 brings new challenges to the retail and logistics industries. 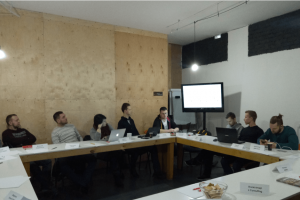 We decided to cope with them together and organize CoreTeka Retail & Logistics Hackathon, the first hackathon in Eastern Europe devoted to the innovations in retail and logistics fields. CoreTeka Retail & Logistics Hackathon is a 3-day marathon the main purpose of which is to bring together fans and professionals in retail and logistics to “hack” current problems in these industries. Hackathon participants are like-minded people who create the innovative platform where IT-world is intercrossed with the brick-and-mortar business and forms a future of retail and logistics industries. The Hackathon can present benefits for the participants as well as for the businesses, operating in retail and logistics industries. See you at CoreTeka Retail & Logistics Hackathon!